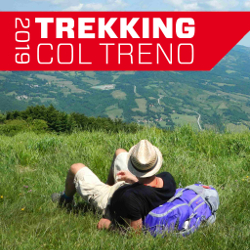 On March 3th inaugurates the 2019 edition of Trekking col treno: 59 excursions scheduled throughout the year and open to everyone. The starting point can be reached by public transport. The long-running initiative promoted by Destinazione turistica Bologna and CAI (Italian Alpine Club) is an invitation to discover the Bologna surroundings through 59 itineraries with different levels of difficulty, accompanied by CAI guides. Treks focus mainly on the landscape gems of the Tosco-Bolognese Appennine but will also include ancient villages, places of remembrance, natural parks and points of geological interest. Cross the Plains north of Bologna along the Samoggia river bank and discover some interesting protected areas with the help of a naturalist Guide. Hike across the reclaimed Plains to reach the lowest CAI (Italian Alpine Club) hut in Italy. Learn about the first experiences of cooperation in the Bolognese plains walking around Granarolo dell’Emilia, a town well-known for milk production. The trekking ends at a local environmental festival. Attention! Please read carefully the “how to participate” page. Fees: 2 euros CAI members, 5 to others. The fee doesn’t include transports, that are at the expense of the participant. Info: For details on the excursions please contact the section of Bologna of CAI (Italian Alpine Club): via Stalingrado 105, ph. +39 051 234856 (Tuesday: 9am-1pm, Wednesday, Thursday and Friday: 4pm-7pm). In the 3 days before the departure of each excursion it is possible to speak with the guide at the number +39 331 9184640 for further information (no SMS), except for the cycle-trekkings, that have a specific phone number indicated in the notes of each excursion.